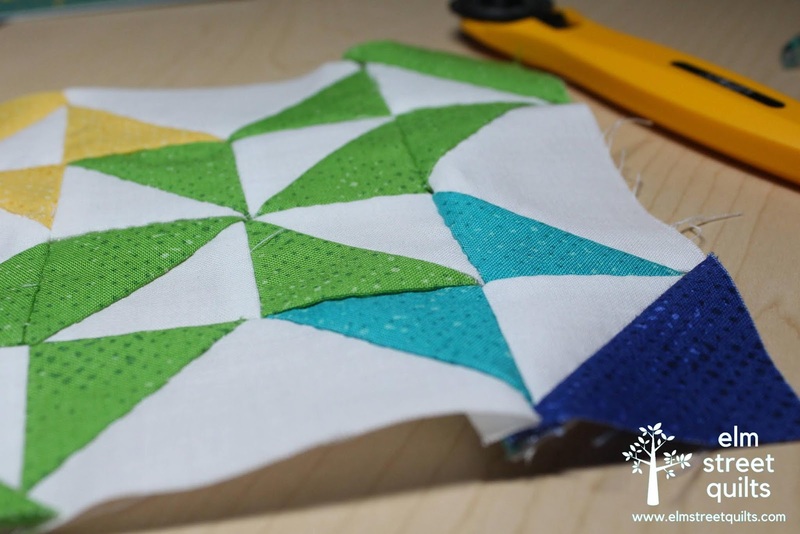 Welcome to the week 6 link-up for the Hand Pieced QAL! We are so excited to see what you have made! 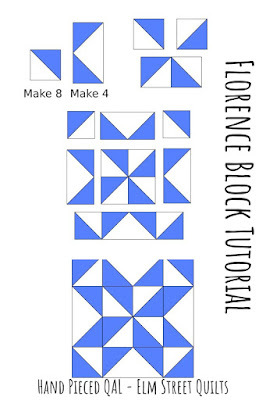 Find the tutorial for this week's block - Florence. This link-up will be open for one week - until Thursday, March 7 (4 am ET/1 am PT). You are welcome to share any and all of the blocks you completed this week. When this link-up closes, a new one will open (magic!) so please don't worry if you fall behind. OLFA offers a comprehensive range of premium cutters, and accessories for quilters and crafters. OLFA introduced the world’s first rotary cutter in 1979. 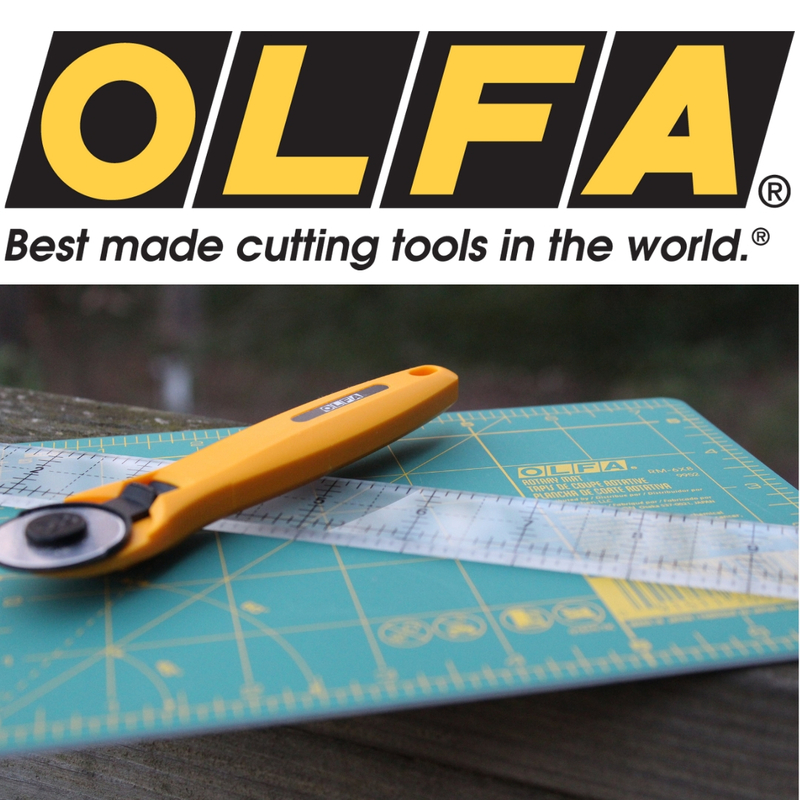 OLFA is offering a 6 x 8’’ cutting mat, a 28mm rotary cutter, and 12 1/2 x 1 1/2 “ ruler perfect for drawing those stitching lines to one lucky participant. 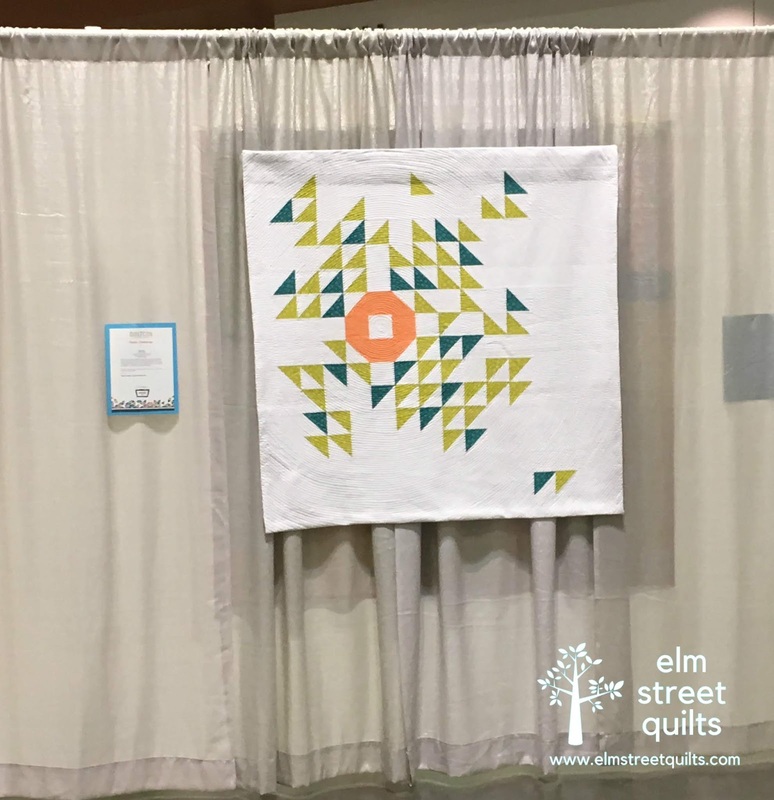 QuiltCon Nashville - My Personal Reflection (part 1) plus a Giveaway! 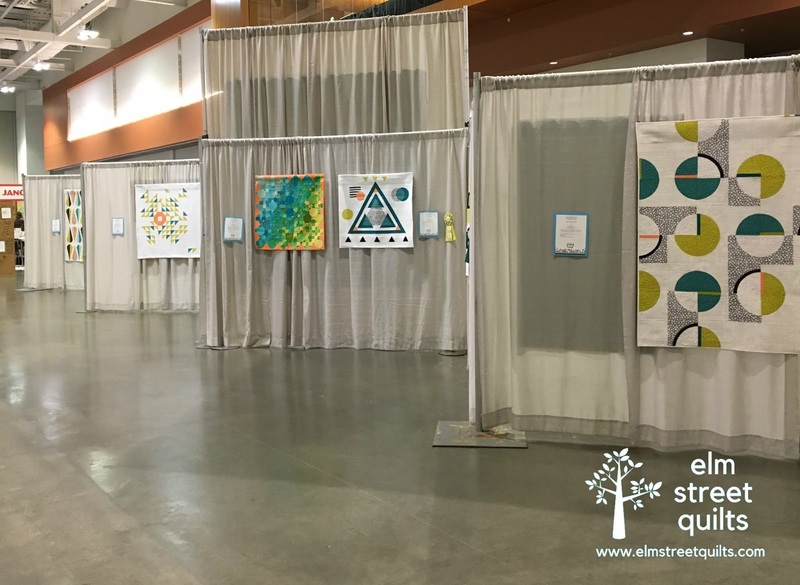 Quilt Con is the Modern Quilt Guild's annual event - a quilt show, combined with classes, lectures and vendors making for an amazing time. Quilt Con 2019 was held in Nashville and I was able to attend for 3 of the 4 days. I had so much fun and wanted to share my experiences across a couple of blog posts. This first post will focus on the fact that I had a quilt in the show. And there is a giveaway so keep reading! 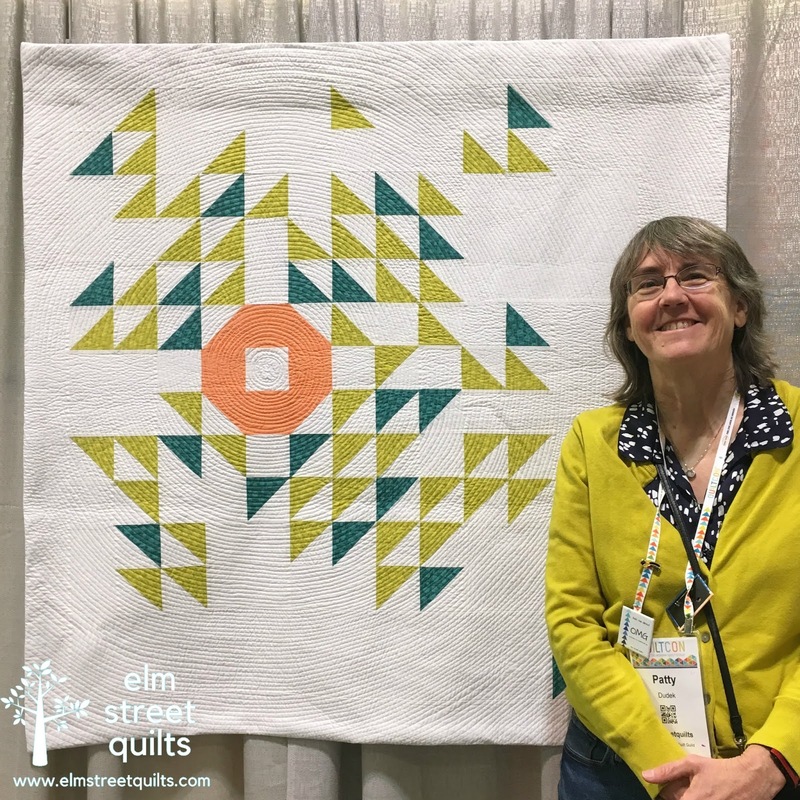 Michael Miller had a challenge category for the 2019 show that involved making a quilt from a specific set of fabrics plus any additional Cotton Couture solids you wanted to add. My friend Paige sent me a bundle of fabrics in the mail and challenged me to do the challenge. Inspired by the Crown of Thorns block my friend Frances was working on (and the pattern I was writing up for her), I decided to use those fabrics to make a modern interpretation of the crown of thorns block. Now, I will confess to have spent time stalking my own quilt. I waited to the end of the day to catch an empty aisle for the above photo. But the most fun was watching people take photos of the quilt, read the blurb I had written and step back and admire it. It gave me quite a thrill. Equally as exciting, this quilt will appear in the March issue of Make Modern magazine!!! You can make your very own version in the colors of your choice. And this is where the giveaway comes in - leave me a comment on this blog post and tell me if you have ever entered a quilt in a show. I'll randomly choose a winner Sunday evening at 8pm ET. If you are a no-reply commenter, please leave your email address. 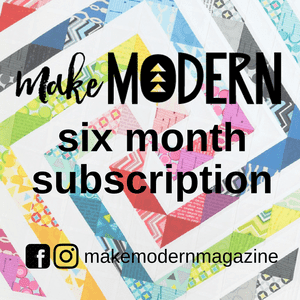 The winner will receive a 6-month subscription to Make Modern magazine! Quilt Con part 2 will post soon! 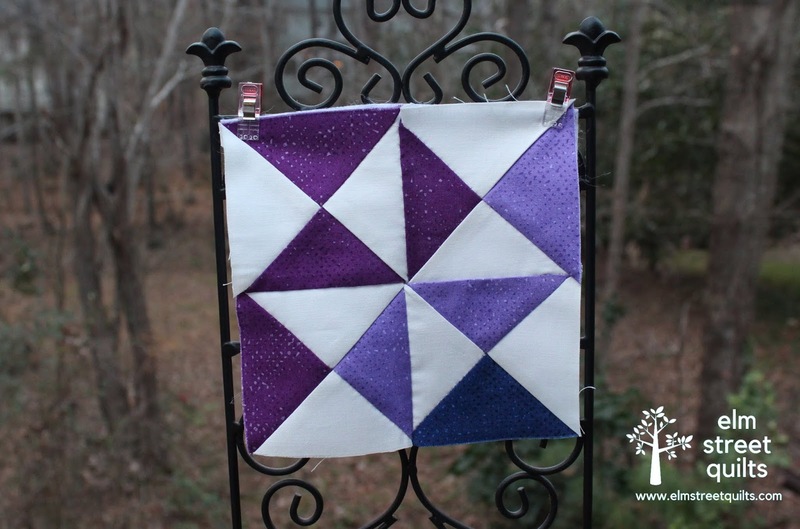 Welcome to week 6 in our Hand Pieced QAL. We are so happy you are sewing along with us! 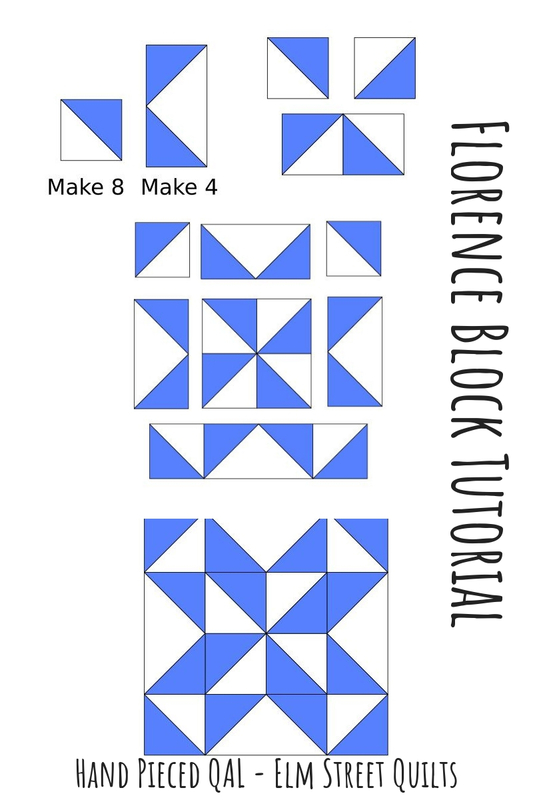 Let's deconstruct the Florence block to better understand what units will need to be hand-pieced. The center block is a pinwheel block constructed with HST and is surrounded by Flying Geese and Half-Square Triangles (HST). 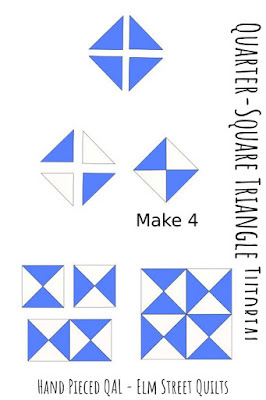 Refer back to the tutorials on hand piecing Half-Square Triangle (HST) You made many of these individual units so far! Choosing fabrics may be the most fun of all depending on which features you want to highlight. 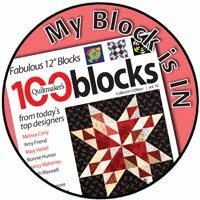 I enjoyed this block because it used several different colors. Remember the key to the seams is to sew through seams, not over them. Use pins to mark the start and end of your stitching lines plus right before and after the seam intersections to make sure everything says lined up. 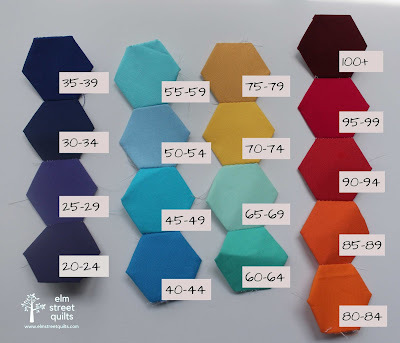 Make (8) HST (follow this tutorial). HST unit should measure 2 x 2''. Make (4) Flying Geese using the stitch and flip method. (Tutorial available.) Flying Geese unit should measure 2 x 3 ½ ''. Assemble (4) HST into a pinwheel shape for the center of the block. Pinwheel unit will measure 3 ½ x 3 ½ ''. Lay the block out according to the diagram and stitch together in rows. The top and bottom row will each measure 2 x 6 ½ '' and the middle row will each measure 3 ½ x 6 ½ ''. The link-up for the Florence block - block 6 in our QAL - opens on Thursday, February 28! Finished blocks can be shared in any weekly link-up, however, so don't worry if you get behind. 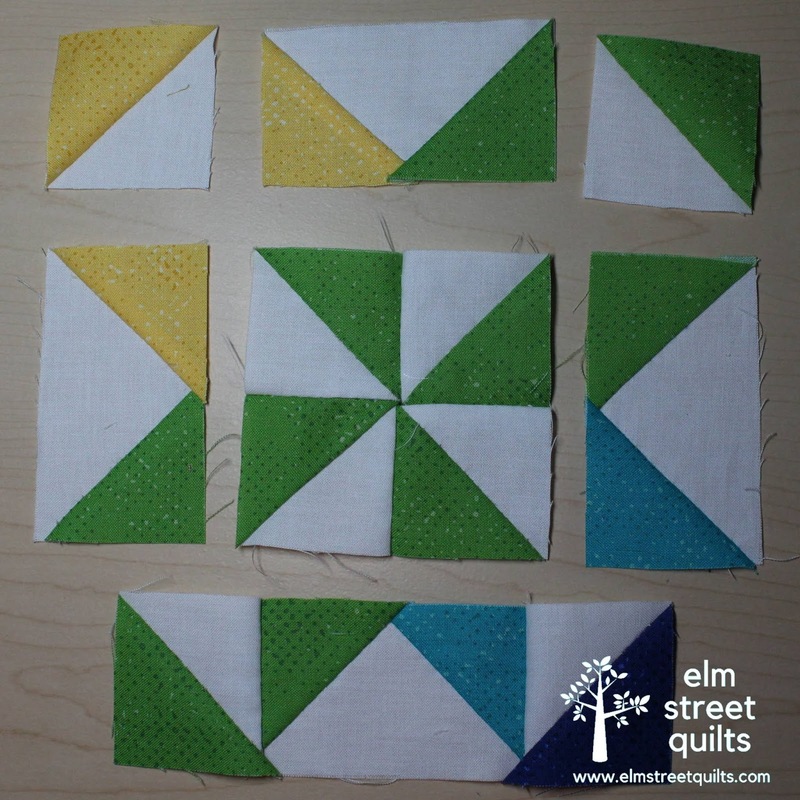 My goal for February is to work on my 2 color version of my Hand Pieced QAL blocks. 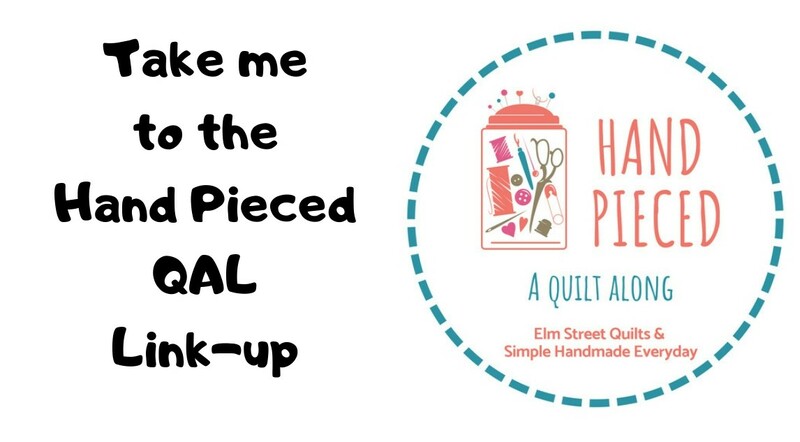 (Interested in hand piecing? Come join the fun!) The blue is the background color - it continues to be great fun to sew up these blocks! 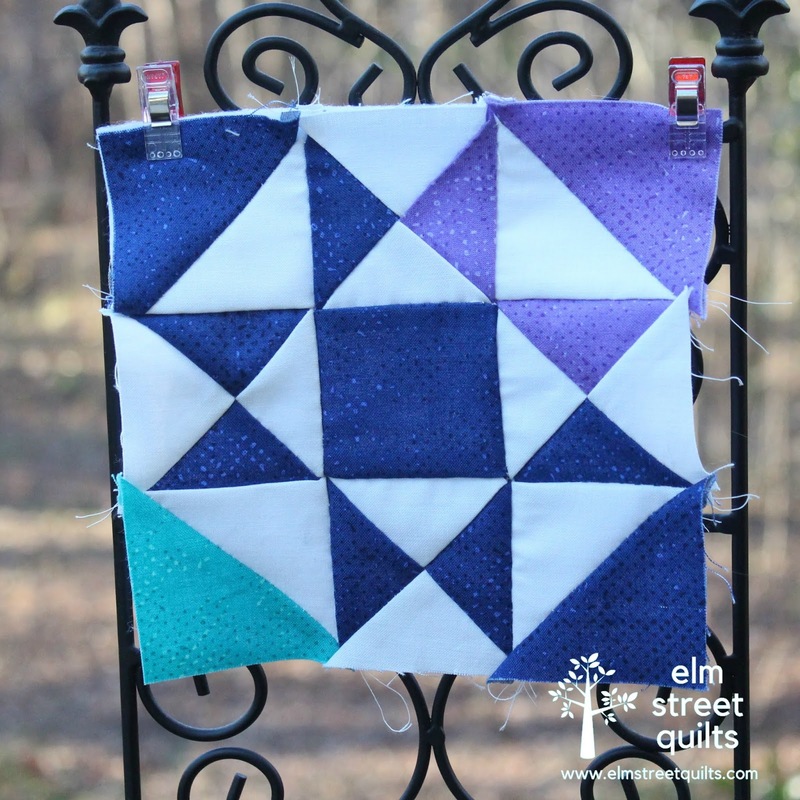 There will be three winners this month - Fat Quarter Shop is offering a $25 gift certificate, Precision Quilting Tools is offering a 17 x 17'' wool mat, and Amy Smart of Diary of a Quilter is offering a pdf pattern from her shop. Congratulations to Nicole, Crystal & Kathryn - our lucky winner for February! Welcome to the week 5 link-up for the Hand Pieced QAL! We are so excited to see what you have made! Find the tutorial for this week's block here. This link-up will be open for one week - until Thursday, February 28 (4 am ET/1 am PT). You are welcome to share any and all of the blocks you completed this week. When this link-up closes, a new one will open (magic!) so please don't worry if you fall behind. 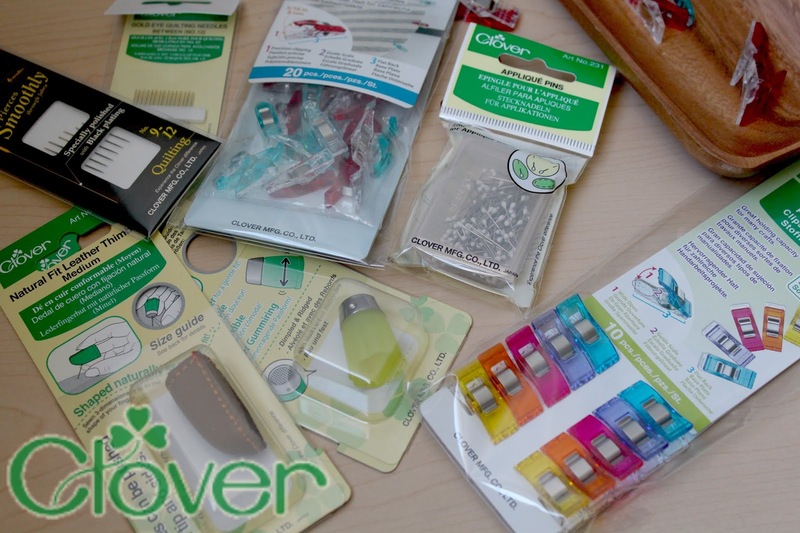 We've got two great sponsors for this week's link-up. 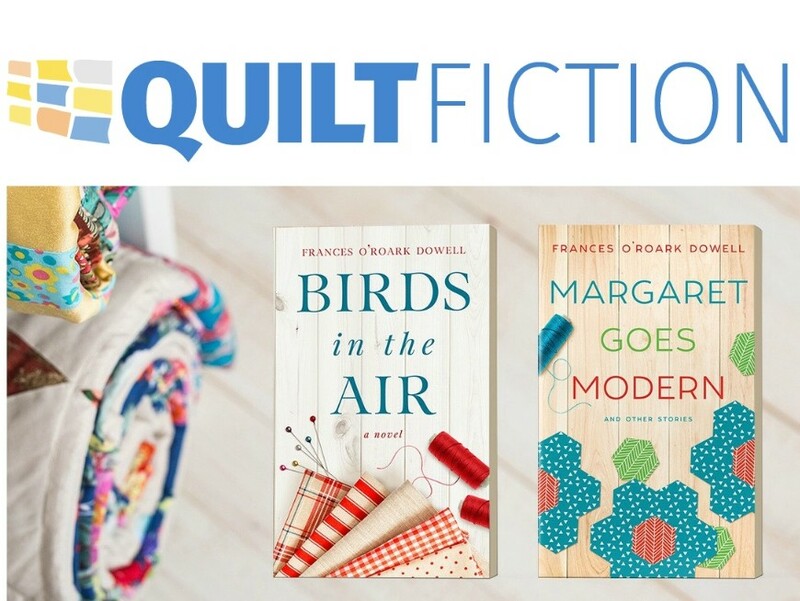 Quilt Fiction is the online home for the quilting stories of Frances O’Roark Dowell, author of the novels Birds in the Air, Friendship Album, 1933 (audio only), the forthcoming Stars Upon Stars (2019), and the story collection, Margaret Goes Modern. For more information visit quiltfiction.com. Colonial Needle Company provides the finest needles, notions, threads and needlepoint supplies for crafting enthusiasts of all skill levels. The lucky winner will receive a copy of Birds in the Air and Margaret Goes Modern plus a prize package from Colonial Needle. Congratulations to Michelle M - the lucky winner of this week's prize!! Dorothy block is assembled from blocks you've already had practice making, namely the Half-square Triangle and Quarter-square triangle. 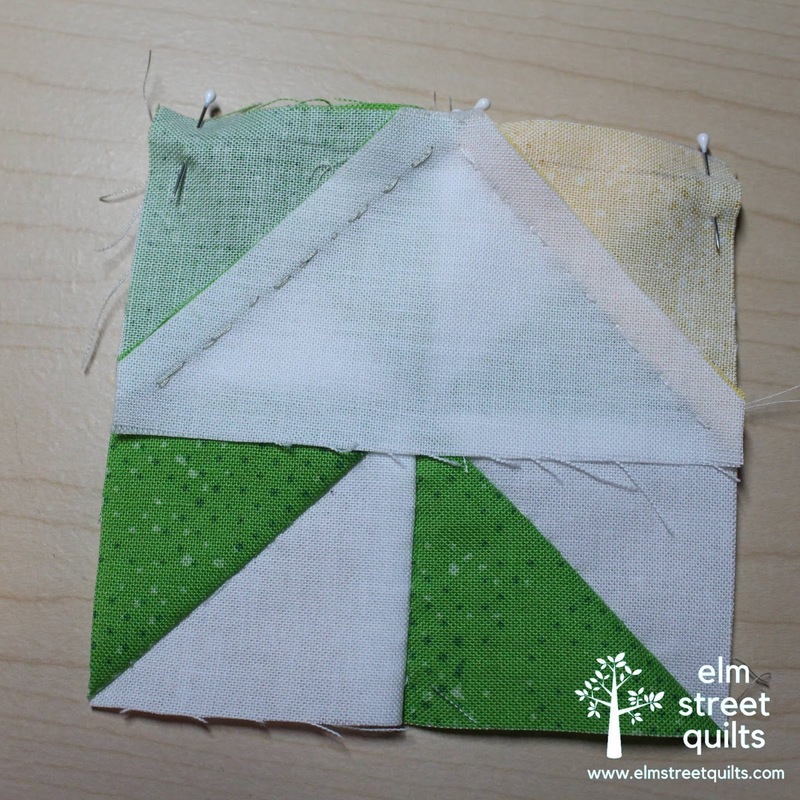 The tutorial for today's block can be found on Kristin's blog. 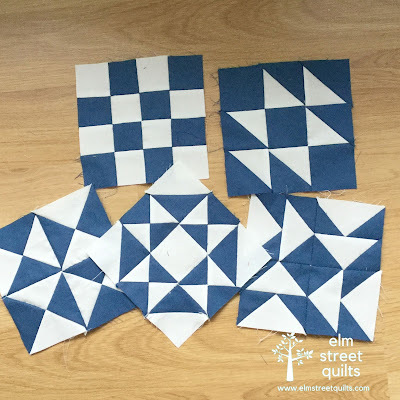 Kristin is hosting the tutorial for the Dorothy block on Simple Handmade Everyday. Click image below to visit tutorial and enjoy time piecing this week's block! 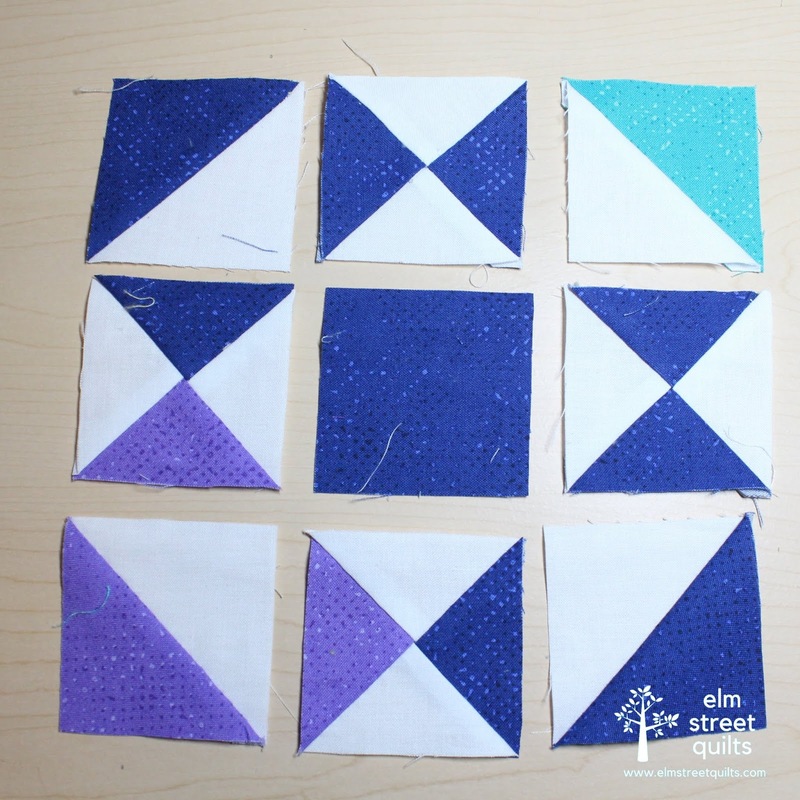 The link-up for the Half Square Triangle (HST) block - block 6 in our QAL - opens on Thursday, February 21! Finished blocks can be shared in any weekly link-up, however, so don't worry if you get behind. I've been working on hand quilting my hand pieced quilt from our Hand Pieced QAL. Around the outside of the quilt in the large areas of background fabric, I've done some big stitch quilting about one inch apart in a white thread. Inside each of the blocks, I have planed to outline each of the color patches with some more big stitch quilting. I may go back and outline the white patches too - haven't yet decided. I am taking this process slow and enjoying every minute. You can tell where I've still got work to do based on where the pins still are! I am using Sulky Petites (affiliate link) for the thread. To hand piece a Quarter-square Triangle block, all our pieces will be cut individually and then stitched together piece by piece. 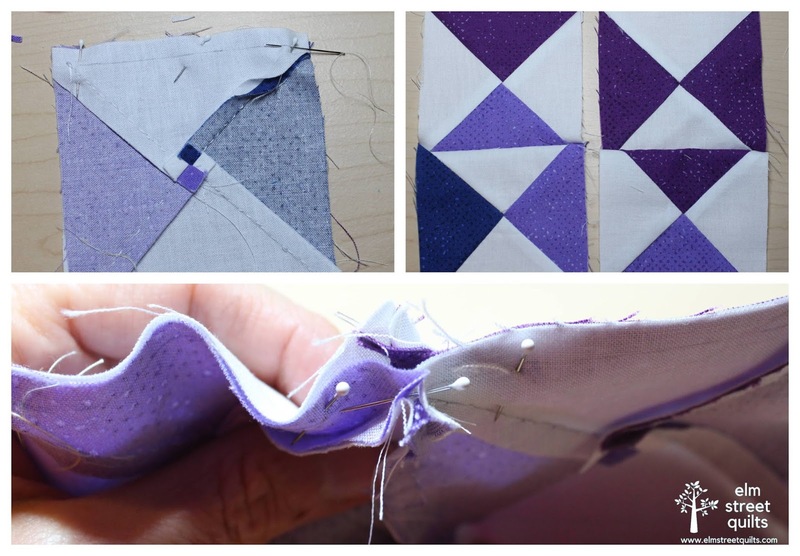 (Put aside any machine sewing assembly methods you typically use to create multiple Quarter-square Triangle blocks!) Although you will be sewing on the bias edge, the pieces are small enough that there isn't much risk to things stretching out of shape. The formula for cutting for Quarter-square Triangle blocks is very simple - take the finished size of the block and add 1 ¼ ''. 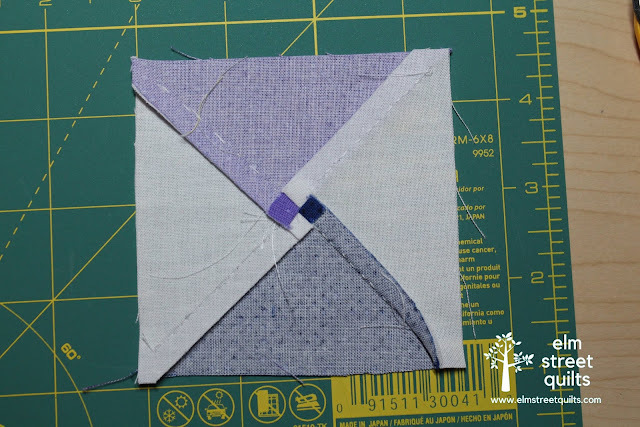 For example, a 3'' finished square (today's block) starts with a 4 ¼ '' square which is then cut across on both of the diagonals. Your first set of stitching lines should be marked on the wrong side of the background square as shown below. (See the tutorial on marking stitching lines.) Stitching line should start and stop ¼'' from each edge. Pin at the start and stop of your stitching lines. Pin at each side of the seam, making sure that seams are aligned. Once complete, press carefully spinning the seams to reduce bulk and to end up with this cute 4 patch on the back. 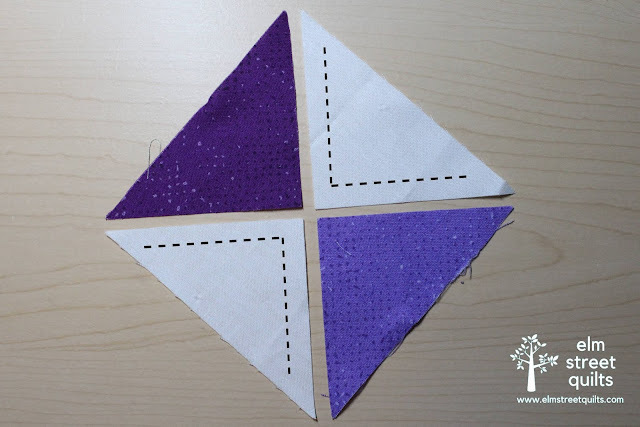 Once all Quarter-square Triangle units are complete, you'll need to sew the Quarter-square Triangle units together in pairs. Stitching lines can easily be drawn with a ruler - your start and stop point is set by the stitches used to construct the block! 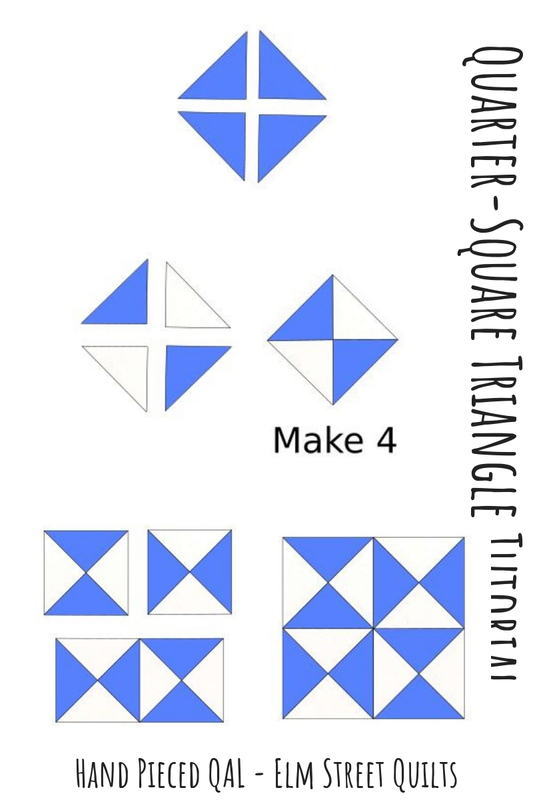 Cut each of the squares into 4 pieces by cutting in half across both diagonals. Take 2 triangles from print fabric and 2 triangles of background fabric and place in the Quarter-square Triangle shape. 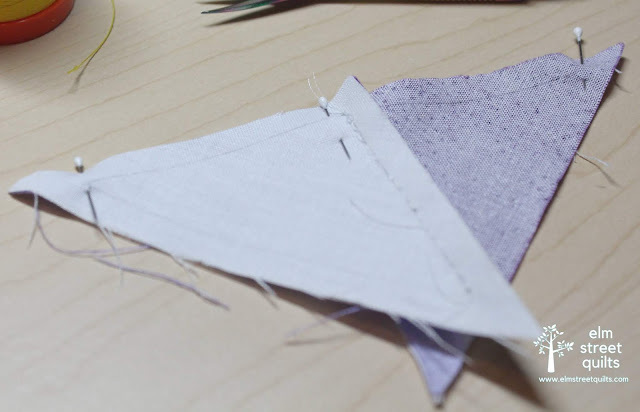 On a background triangles, mark your initial 2 stitching lines along each of the cut edges (see photo above). Stitch along one side, starting 1/4" from the edge and stopping 1/4" from the end. Finger press open, pressing seam allowance to the print side. Repeat for second triangle pair. 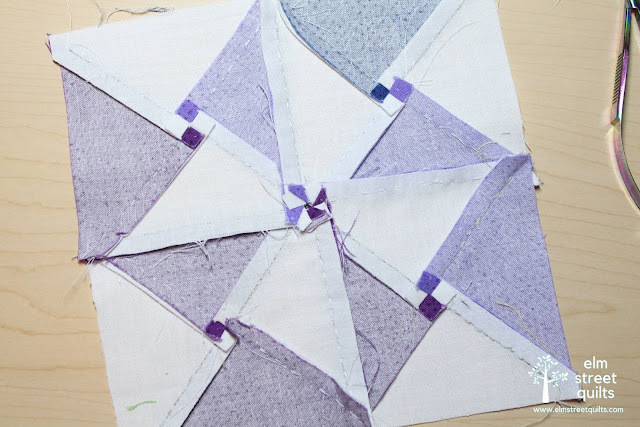 Stitch each half of the block together, starting 1/4 '' from the edge and stopping 1/4'' from the end. Stitch through the seam of the triangle pair, backstitching right before and right after going through seam. Trim Quarter-square Triangle (if necessary) to 3 1/2 ‘’, taking care to spin seams on back. Repeat to make a total of four (4) HST. Following diagram, assemble block into rows after marking the stitching line on the wrong side of each block. Your stitching will start 1/4" from the edge and stopping 1/4" from the end. Fold the Quarter-square Triangle seam to the side so it is not caught in the stitching. Each row will measure 3 1/2 x 6 1/2''. Mark stitching lines on one row. Place two rows together, RST, as shown in diagram. Pin at the each of the seam intersections, as well as the beginning and ending of the stitching line. The link-up for the Quarter-Square Triangle block - block 6 in our QAL - opens on Thursday, February 14! Finished blocks can be shared in any weekly link-up, however, so don't worry if you get behind. One last overall look at my 2018 temperature quilt with the newly applied binding. The binding incorporates the temperature scale, wrapping around from the coldest to the warmest temps. Using the same fabrics and color plan as 2018, I've started my temperature quilt for 2019. This will be handpieced, each 2'' (unfinished) square represents the high temperature of the day. One of the key reasons for sticking with the same colors is I can do a quick side by side compare. While January 2018 had a stretch of very cold days, overall it had many more days in the 60s or above than January 2019. In the above photo, January 1 is on the right - you can see much colder the first week of January was compared to this year. There are a lot of ways to make a temperature quilt. 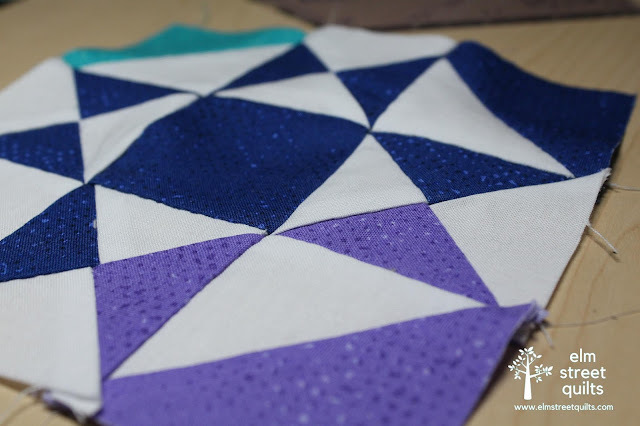 I choose hexies this year and hand piecing this year because I wasn't to end the year with a quilt top instead of a pile of blocks. I also wanted to be able to sew each block while I waited for my daughter each night to go through her bedtime routine. 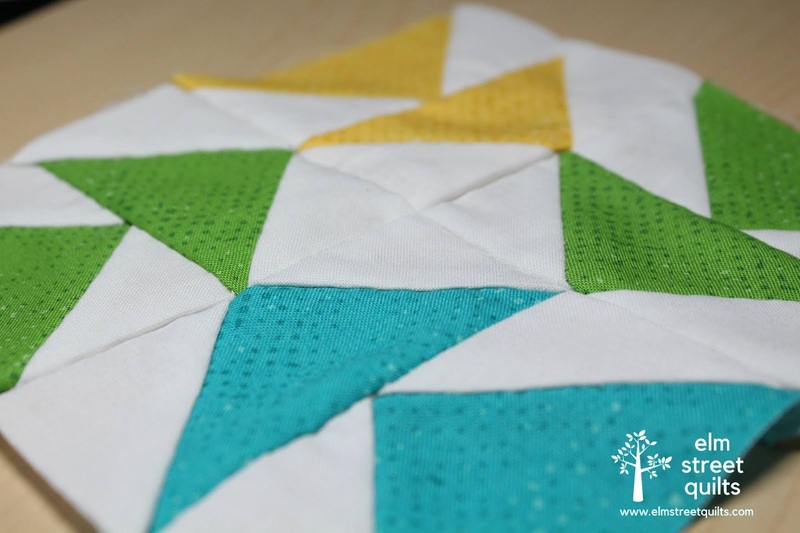 Welcome to the week 3 link-up for the Hand Pieced QAL! We are so excited to see what you have made! Find the tutorial for this week's block here. This link-up will be open for one week - until Thursday, February 14 (4 am ET/1 am PT). You are welcome to share any and all of the blocks you completed this week. When this link-up closes, a new one will open (magic!) so please don't worry if you fall behind. Aurifil is the most popular thread in the quilting industry. 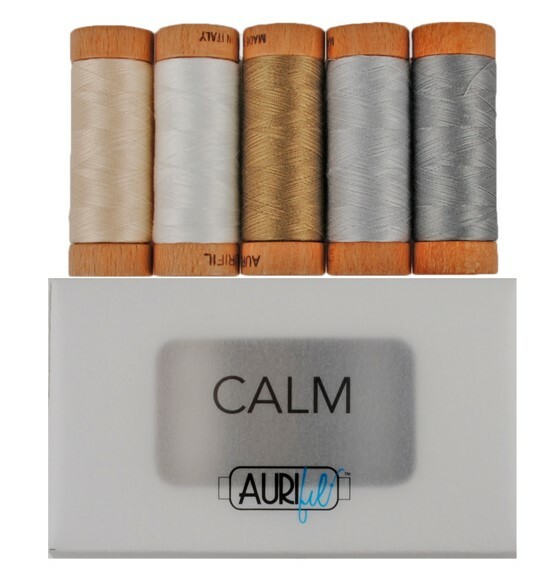 Available in many different thread weights and dozens of colors, the superior, long staple cotton thread boasts high tensile strength and a wonderful silky touch Aurifil is offering a small spool thread collection Calm to one lucky participant. Photos can be shared from a blog, Flickr, or Pinterest and much include a link to Elm Street Quilts or Simple Handmade Everyday. Photos can also be shared via a public Instagram and must contain the tag #handpiecedqal. Don't have a way to share? You can also email them to handpiecedqal@gmail.com Read the link-up tutorial to learn more!